DALLAS, TX — The storyline heading into last night’s “featherweight title” match between Mikey Garcia and Juan Manuel Lopez was shaken up on Friday when Garcia, the WBO and RING champion, came in two pounds over the featherweight limit. He looked completely drained and sickly at the weigh-in, prompting his team to state they tried their best and would be paying $150,000 in penalties to Lopez ($75K for each pound) rather than try to lose the weight. Garcia’s appearance, coupled with later confirmed footage of him throwing up, had some observers reversing their original picks of an easy Garcia win and going with the JuanMa upset. While their reasoning was sound, the weight issue turned out to overblown, as Garcia’s counter-punching easily broke down Lopez’s reckless offense for two heavy knockdowns in route to an easy fourth round TKO. Let’s get right to the highlights from the American Airlines Arena. THE 30 YEAR OLD “OLD” MAN: Unless you’re a teenager, you realize that 30 years old is far from old. In fact, some would argue you don’t become officially grown until that age. Boxing is different — depending on your career path, you can be a fresh fighter at that milestone age, or a mentally and physically broken down wreck of a man. Like cars, boxers get miles on them with each training camp, sparring session, weight-cutting and fight. At some point, the body shuts down and says enough. JuanMa, with his 4 year string of wars, has his mileage in the area of 150-200K as he approaches his 30th b-day on June 30. If you had no prior knowledge of who had the weight problems, you’d think JuanMa Lopez was the one who was drained last night. His balance was horrendous – he constantly leaned too much weight onto his front foot, making his jabs and right crosses ponderous and easy to counter. His punching form was flailing and most grievous of all, his head movement was non-existent. His telegraphed punches lead to the first knockdown in the second, courtesy of a Garcia right hand counter. For the rest of that round and the third, Garcia popped Lopez’s head backwards with flush jabs from distance and ripped hooks (all head shots) whenever Lopez plodded forward with his head stationary. 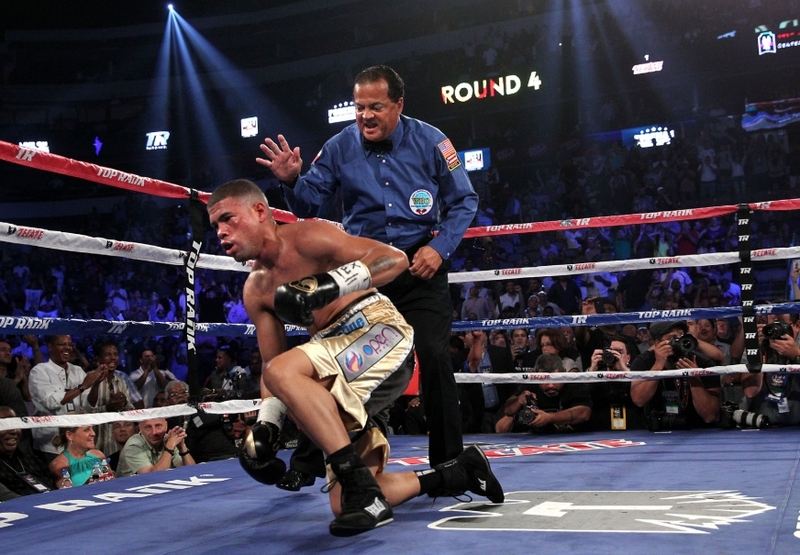 Lopez, whether through damage-induced delusion or just hubris in the face of his fate, told his corner before the fateful fourth that the fight was frustrating because Garcia “was running too much.” Ironically, it was Lopez who would run into a right hand early in the fourth that scrambled his dulling consciousness, making him involuntarily flap his arms skyward as if shaking out his muscles after a nice jog. Garcia followed up the blow with a crushing left hook to the center of JuanMa’s face that put the proud Puerto Rican flat on his back. For a few seconds into the referee’s count, Lopez appeared lifeless. 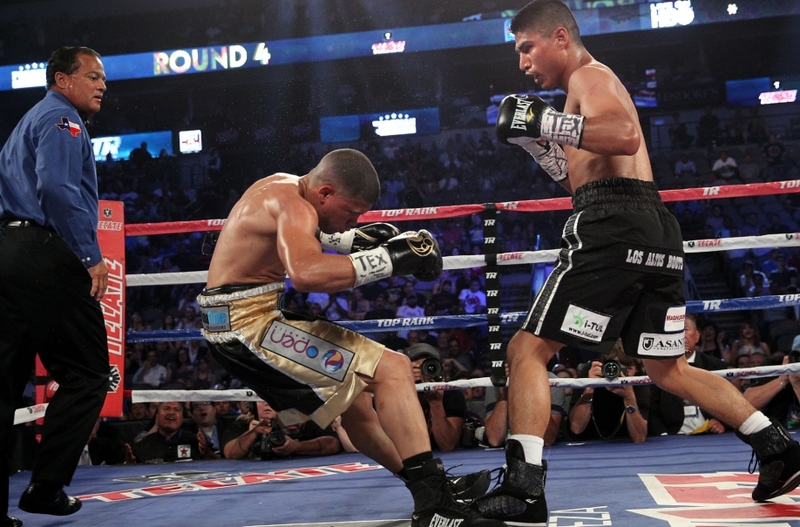 But as he’s done every time in his career, Lopez rose to beat the ten-count. Unfortunately for him, all that was left was his instinct — Lopez’s legs and awareness were off in another dimension, prompting a merciful stoppage. Watch the full fight HERE. TIME FOR JUANMA TO RETIRE? : Calling it a career should certainly be a strong option even though Lopez only has three losses on his ledger (Salido 2X and now Garcia). It’s the not the record, but the way he’s been looking in the ring and string of battles dating back to 2009. He’s had thrilling wars in the last four years with Gerry Penalosa, Rogers Mtagwa, Bernabe Concepcion, Rafael Marquez and Orlando Salido (twice at that). With his coordination and balance regressing, his once fight-changing power has been dulled as well, giving him no bailout or equalizer in these fights. GARCIA’S ATTITUDE GETS HIM A PASS: First off, Mikey Garcia’s post-fight interview where he mentioned still trying to stay at featherweight was laughable. He risks sure-fire damage to his body if he tries to continue making a weight his body has clearly said no to. Let this also be clear — Garcia’s team knew full well he wasn’t going to make the weight. The two pounds was not a surprise to them, and at some point during the last week or so they said forget it and basically paid for a weight advantage, as JuanMa was the only one in there who completed the bodily toll required to get in under 126 pounds. It’s highly unprofessional and the recent fighter’s who done this, most notably Adrien Broner, have gotten blasted in the media for it. But in the 24 hours since Friday’s weigh-in, most of the media didn’t go in to hard on Garcia. Wonder why? The media can play favorites, and Garcia’s “humble attitude” is essentially why he wasn’t crucified as opposed to Broner, who joked online about his weight problem by putting up pictures of twinkies and another junk food he was consuming. Is it fair? Absolutely not, b let’s hope this is the last time we see this type of behavior from Garcia. 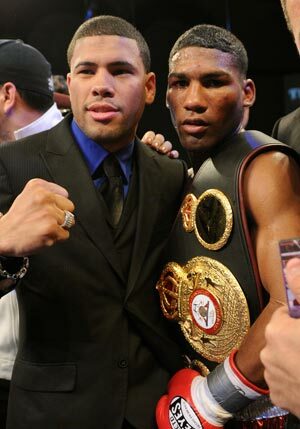 STILL MAD ABOUT LOPEZ VS. GAMBOA: From 2009-2010, one of the best fights that could have been made at the lower weights was JuanMa vs. Gamboa. Both were under Top Rank and it would have been an easy fight to make. Instead, Top Rank CEO Bob Arum said flat-out at a press conference that he didn’t give a damn what the fans wanted, and would let the fight “marinate” at least a year more to get the most money possible. Well, that turned into several JuanMa KO defeats and Gamboa defecting to Mayweather Promotions briefly and now 50 Cent’s SMS Promotions (and his skills regressing with inactivity). The fight is completely dead at this point, all because greed trumped what was obvious to everyone — that you had two exciting but ultimately limited fighters whose prime window would not be long. CRAWFORD HAS EASY OUTING: Courtesy of Max Kellerman giving gushing praise (calling Crawford the best lightweight in the world), it’s clear that HBO wants to see Crawford step into the lower weight limelight left with Broner’s departure to Showtime. Having just stepped up his competition in his last fight (a decision win over Breidis Prescott), Crawford still needs to get in there with some legit top 10 talent. His opponent last night, Alejandro Sanabria, was not in that class and took a beating to the body before being put into a “stop, drop and roll” animation courtesy of a Crawford lead left hook. Watch the full fight HERE.